All transactions are safe and secure with a reliable history in online purchasing behind each of our associates. Buy the Family Guy Peter vs. Chicken t-shirt to own Family Guy clothing and merchandise. This dark tee features a cartoon-like image of Peter Griffin taking on his arch nemesis in Quahog, the Giant Chicken. 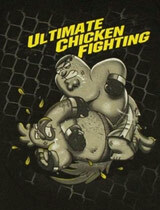 Above the contenders on this Peter vs. Chicken tee is the phrase, "Ultimate Chicken Fighting". The freakin' sweet design on this Family Guy t-shirt is a funny tribute to the TV show's two biggest heavyweights and their no holds barred battles. In addition to the Family Guy Peter vs. Chicken tee above, browse the Family Guy Clothing Gallery for more apparel like men's and women's clothes, kids shirts or hoodies.